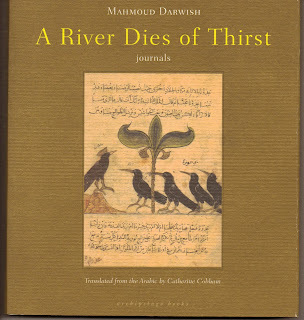 We have just received a new collection of poems by Palestinian poet Mahmoud Darwish (we carry a number of his books) His new book A River Dies of Thirst - journals - is translated from the Arabic by Catherine Cobham and published by Archipelago Books. Darwish has said "I want to find a language that transforms language itself into steel for the spirit - a language to use against these sparkling silver insects, these jets. I want to sing, I want a language...that asks me to bear witness and that I can ask to bear witness, to what power there is in us to overcome this cosmic isolation." Quite a poem - that one by Mahmoud Darwish, Gary. Thanks for sharing it. Sitting in book designer David Bullen's office with poet Jerry Martien yesterday looking at the entire gorgeous collection of Archipelago Books. This one by Darwish is a tour de force. Long live archipelago.